The subtitle of this book pretty much describes the substance of this book. Written by Johnny Walker (not his real name to protect him and his family still necessary to this day) about the Iraqi view of the wars in Iraq and how he and many others had to fend for themselves against brutality in their hometown. Many of the places in the book you have heard of and they probably bring up visions of bombings and constant military action. 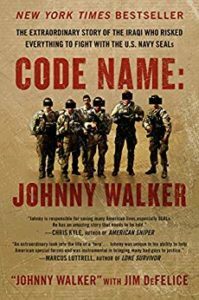 Johnny Walker ended up becoming an interpreter (terp) for the Navy SEALs and by accounts was extremely helpful in bringing the fight to the bad guys. It is most interesting that Mr. Walker’s account are vastly different than the headlines that most of us were treated to in American papers. Rather than brutal villains, most soldiers were really trying to rebuild Iraq and help the citizens get on their feet. I had this book in my library for a very long time. For some reason, I didn’t want to start it…probably because I expected it to be written like a history book. It wasn’t! this book reads like it’s being told by a very good story teller. Mr. Walker and his co-author, Jim DeFelice did a masterful job telling this story. Don’t hesitate to read this book and learn about the real Iraqis and the American soldiers. This article was published on Jan 23, 2019 . It is tagged Code Name: Johnny Walker. You can follow any responses to this article through the comment RSS feed.